The first reveals for Duo! AUTO [VC]: When this unit’s attack hits a vanguard, choose two cards from your hand, reveal them, your opponent chooses a card from among them, search your deck for up to one card with the same card name as the card chosen by your opponent, reveal it, put it into your hand, shuffle your deck, and if the card put into your hand has “Duo” in its card name, Counter Charge 1. ACT [Hand]: [Counter Blast 1-card with “Duo” in its card name & Discard this card] Choose one of your grade 2 or greater rear-guards that has “Duo” in its card name, return it to your hand, search your deck for up one card with the same name as that unit, reveal it, put it to your hand, choose a card from your hand, and discard it. Shuffle your deck. For Today’s Card, we’re introducing the following 2 cards from the Clan Booster “Prismatic Divas” (on sale July 7th, 2017) that strengthen 《Bermuda Triangle》’s “Duo”! 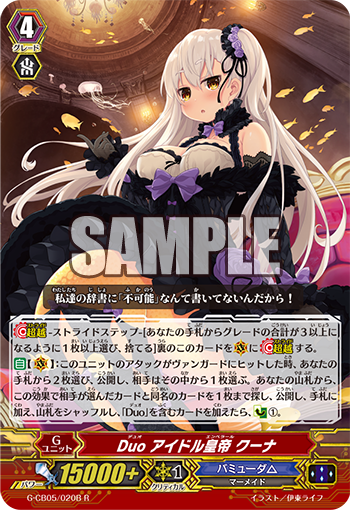 “Duo Idol Empress, Kuna” has an ability that adds cards with the same name to the hand! When an attack hits the Vanguard, you can reveal 2 cards from your hand, your oppoinent chooses 1 among them, then you can add a card with the same name as the card chosen by your opponent. And, when you add a “Duo” card to your hand, you Counter Charge 1! If you add the Perfect Guard “PR♥ISM-Duo, Aria” and the Heal Trigger, “Duo Tropical Healer, Medjerda”, you’ll be able to sure up your defenses for next turn. “Prismatic Divas” contains a new Grade 4 “Reit” that uses cards with the same name as a Cost, so seek to activate this card’s ability to add cards with the same name to your hand. “Duo Stream Showtime, Peytonia” has an ability that supports adding cards with the same name from the hand. By discarding itself from the hand, you can Return a Grade 2 or higher Rear-guard back to the hand, then add an additional copy of that card to your hand, then discard 1 card from your hand. By returning “Duo Fantasia, Lamry” to the hand, you can use the ability of “Lamry”, which adds two copies of the same card to your hand. So let’s gather a ton of cards with the same name and use them for your Trump Cards. From here on out, we’ll be introducing cards from “Prismatic Divas”! Also, today’s “Weekly Vanguard News Bits” will be introducing cards from the Trial Deck “Debut of the Divas”. Be sure to check it out! Cardfight Coalition staff. Someone who plays way too many card games.